The subjects of electromagnetics and electromagnetic fields theory constitute a fundamental base in the study of electrical and electronic engineering and systems. It has been noticed that the concepts pertinent to these subjects are difficult to grasp by the average university student. Because of this difficulty these subjects need to be exposed in a way that is conducive to their understanding by these students. With this in mind the author presented the student with an elucidated revision of vector theory, one of the mathematical bases of the electromagnetic fields theory and developed the subsequent chapters in an easy-to-follow style. The intricacy of the mathematics normally used in the exposition of these concepts and the analyses necessary to present them in a logically graspable manner call for many solved examples and unsolved exercises for student training and familiarization. The author, being an experienced university professor, managed to cater for both aspects, and has presented the concepts in an easy-to-follow, streamlined style supported by many diverse solved examples besides a large collection of problems to be tried by the student. Besides the excellent style and the many and diverse solved examples and large collection of exercise problems, the author illustrated the concepts with well prepared and nicely and clearly presented figures to facilitate understanding of the underlying mathematics and comprehension of the subject concepts. Although the book is targeting mainly undergraduate university students the rich manner in which it is prepared makes it extremely useful and helpful to graduate students, researchers and university instructors who shoulder the responsibility of teaching these subjects. This textbook bridges the gap between the advanced and the introductory books in engineering electromagnetics. Although many excellent texts cover in details the introductory topics suitable for junior undergraduates, some topics, which may be important to higher-level undergraduates and beginning graduates, are ignored or not given the same attention. These topics include the application of the multi-pole expansion in electromagnetic fields problems, the solution of electrostatic boundary value problems in cylindrical and spherical coordinate systems, the detailed analysis of waveguides including circular waveguides, the topic of metamaterials, the refraction through metamaterials and the concept of negative refractive index. 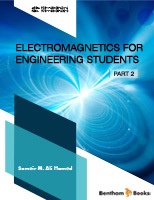 The book exposes to these topics in sufficient details while retaining the usual introductory topics in electromagnetics, which makes it useful textbook for both undergraduate and introductory graduate courses in electromagnetics. The book presumes that the student is acquainted with the general knowledge in differential and integral calculus, differential equations, vector analysis, and complex numbers. The book is divided into two parts, each part contains seven chapters. Part 1, which extends from Chapter 1 to Chapter 7, covers the fundamental laws and concepts of electromagnetic fields and materials. Part 2 extends from Chapter 8 to Chapter 14 and deals with the problems of the propagation and transmission of electromagnetic energy through unbounded and bounded media in addition to principles of antennas. Part 1 covers the fundamental topics of electromagnetics. Chapter 1 has been devoted to review vectors analysis, since it is an essential topic to understand the subject of electromagnetics. The electrostatic field and related concepts and laws are covered in Chapter 2. Chapter 3 discusses the electric properties of the materials. In Chapter 4, more advanced techniques are introduced to solve the boundary-value problems in electrostatics. The magnetostatic field and related concepts are covered in Chapter 5. Chapter 6 discusses magnetic materials and introduces metamaterials and their properties in an appropriate depth for the level of undergraduate students. In Chapter 7, Maxwell’s equations are presented in integral and point form for time-varying fields, in addition to the concept of vector potential, boundary conditions for time-varying fields and Poynting vector. Part 2 (Chapter 8 to Chapter 14) presents more advanced topics covering wave propagation, waveguides, transmission lines and antennas. The wave propagation and associated parameters in different media are discussed in Chapter 8. The reflection and transmission of plane waves at the interfaces between two different media in addition to the concept of negative refractive index are considered in Chapter 9. The metallic waveguides and resonant cavities of rectangular and circular cross sections are analyzed in Chapters 10 to 12. The behavior of transmission lines in frequency domain is discussed in Chapter 13. Basic concepts of antennas and radiation from some metallic structures are presented in Chapter 14. The intended audience of the book are the undergraduate students in the field of electrical, electronics, telecommunications, and computer engineering and related fields. The topics of the book are presented in sufficient details, such that the students can follow the analytical development easily. Each chapter is supported by numerous illustrative examples, solved problems, and end of chapter problems to explain the principles of the topics and to enhance the knowledge of the student. I would like to express my profound gratitude to Associate Professor Dr. Mohammed Ali H. Abbas form the University of Khartoum who read the draft of the book and gave useful and constructive comments that improved greatly the contents of the book.